I got verify error at disc copying, the error does not occur on the PC with Windows 8 preinstalled but after some update including drivers then encountered the error. Is there any information resources or similar cases? Roxio Creator LJ version 12 is preinstalled. Creator LJ is sold under special conditions, to the Original Equipment Manufacturers (OEMs) who preinstall it on the computers they sell. The OEM company is supposed to give you any support you need. You need to go back to the OEM who sold your computer to you - Fujitsu, NEC, Toshiba, Dynabook or whoever - since the gurus here don't have a copy of this software to examine and operate, we can't solve your problem. If you do an internet search on "Creator LJ" you will see a number of search results in Japanese. They might be what you're looking for. 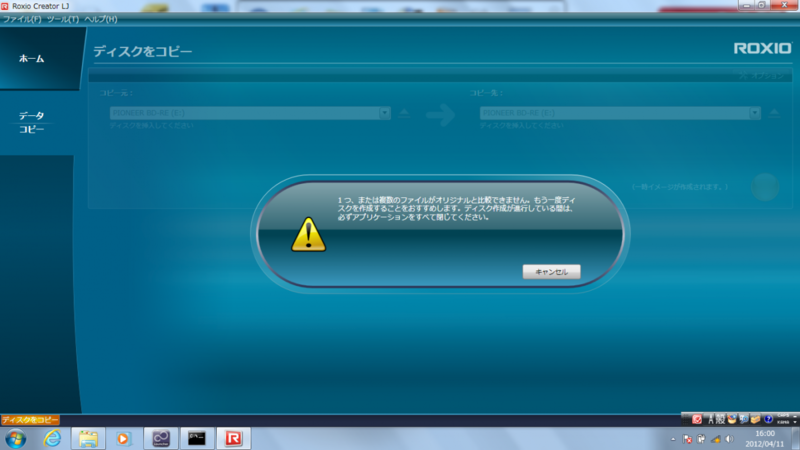 I'm sorry, but I can't read Japanese. Thanks for tips. I have contacted to the PC vendor I purchased, the problem is resolved by updating AHCI/SATA driver to the latest version. Figured out that some versions at Windows 8 moment had a data corruption issue on DVD drive, the current version works without the verify error. Thank you very much for giving us an update and letting us know how you fixed the problem. I'm very glad I could point you in the right direction, and the PC vendor was able to help you.